The symbol of Kopimi, an anti-copyright initiative developed by the Piratbyrå, a Swedish organisation actively opposing modern copyright law and practices, and the previous operators of BitTorrent tracker The Pirate Bay, before it was spun off as an independent organisation. Opposition to copyright or anti-copyright is opposition to the current state of copyright law, or perhaps copyright as a concept. Opposition groups often criticize philosophical, economical, or social rationales of such laws and the laws' implementations, the benefits of which they claim do not justify the policy's costs to society. Adherents advocate for changing the current system, though different groups have different ideas of what that change should be. Some call for remission of the policies to a previous state—copyright once covered few categories of thing and had shorter term limits—or they may seek to expand concepts like Fair Use that allow permissionless copying. Others seek the abolition of copyright itself. Opposition to copyright is often a portion of platforms advocating for broader social reform. For example, Lawrence Lessig, a free-culture movement speaker, advocates for loosening copyright law as a means of making sharing information easier or addressing the orphan works issue and the Swedish Pirate Party has advocated for limiting copyright to five year terms in order to legalize the majority of its members' downloading of modern works. French group Association des audionautes is not anti-copyright per se, but proposes a reformed system for copyright enforcement and compensation. Aziz Ridouan, co-founder of the group, proposes for France to legalise peer-to-peer file sharing and to compensate artists through a surcharge on Internet service provider fees (i.e. an alternative compensation system). Wired magazine reported that major music companies have equated Ridouan's proposal with legitimising piracy. In January 2008, seven Swedish members of parliament from the Moderate Party (part of the governing coalition), authored a piece in a Swedish tabloid calling for the complete decriminalisation of file sharing; they wrote that "Decriminalising all non-commercial file sharing and forcing the market to adapt is not just the best solution. It's the only solution, unless we want an ever more extensive control of what citizens do on the Internet." It is unclear that copyright laws are economically stimulating for most authors, and it is uncommon for copyright laws to be evaluated based on empirical studies of their impacts. One of the founders of Piratbyrån, Rasmus Fleischer, argues that copyright law simply seems unable to cope with the Internet, and hence is obsolete. He argues that the Internet, and particularly Web 2.0 have brought about the uncertain status of the very idea of "stealing" itself. He argues that in an attempt to rein in Web 2.0, copyright law in the 21st century is increasingly concerned with criminalising entire technologies, leading to recent attacks on different kinds of search engines, solely because they provide links to files which may be copyrighted. Fleischer points out that Google, while still largely uncontested, operates in a gray zone of copyright (e.g. the business model of Google Books is to display millions of pages of copyrighted and uncopyrighted books as part of a business plan drawing its revenue from advertising). In contrast, others have pointed out that Google Books blocks-out large sections of those same books, and they say that does not harm the legitimate interests of rightsholders. "Free Beer" demonstrator supporting the "freedom of knowledge" idea: "Copyright is preventing access to knowledge" (2007). 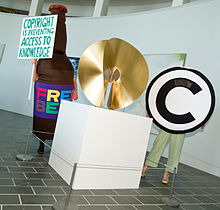 Groups such as Hipatia advance anti-copyright arguments in the name of "freedom of knowledge" and argue that knowledge should be "shared in solidarity". Such groups may perceive "freedom of knowledge" as a right, and/or as fundamental in realising the right to education, which is an internationally recognised human right, as well as the right to a free culture and the right to free communication. They argue that current copyright law hinders the realisation of these rights in today's knowledge societies relying on new technological means of communication and see copyright law as preventing or slowing human progress. ^ Larry Lessig (2007-03-01). "Larry Lessig says the law is strangling creativity". ted.com. Retrieved 2016-02-26. ^ "Swedish "Pirates'" Call for IP Reform Spurs Global Interest". Intellectual Property Watch. 2006-09-04. Retrieved 2018-09-03. ^ a b Rose, Frank (September 2006). "P2P Gets Legit". Wired. ^ Byfield, Bruce (May 2006). "FSF launches anti-DRM campaign outside WinHEC 2006". Linux. ^ Rose, Frank (April 2012). "Challenging Copyright". Kopimism. ^ Byfield, Bruce (May 2012). "The case for copyright reform". Kopimism. ^ Moglen, Eben. "dotCommunist Manifesto". ^ Sarno, David (April 2007). "The Internet sure loves its outlaws". Los Angeles Times. ^ Mitchell, Dan (August 2006). "Pirate Take Sweden". The New York Times. ^ Kim, Melanie. "The Mouse that Roared, Grey Tuesday". Tech Law Advisor. Archived from the original on July 4, 2008. Retrieved 2008-07-25. ^ Werde, Bill (February 2004). "Defiant Downloads Rise From Underground". The New York Times. ^ Bangeman, Eric (January 2008). "Swedish prosecutors dump 4,000 legal docs on The Pirate Bay". Ars Technica. ^ Rostama, Guilda (June 1, 2015). "Remix Culture and Amateur Creativity: A Copyright Dilemma". WIPO. Retrieved 2016-03-14. in 2013 a district court ruled that copyright owners do not have the right to simply take down content before undertaking a legal analysis to determine whether the remixed work could fall under fair use, a concept in US copyright law which permits limited use of copyrighted material without the need to obtain the right holder's permission (US District Court, Stephanie Lenz v. Universal Music Corp., Universal Music Publishing Inc., and Universal Music Publishing Group, Case No. 5:07-cv-03783-JF, January 24, 2013).[...] Given the emergence of today's "remix" culture, and the legal uncertainty surrounding remixes and mash-ups, the time would appear to be ripe for policy makers to take a new look at copyright law. ^ "What is Copyleft?". Archived from the original on July 29, 2008. Retrieved 2008-07-29. ^ "Frequently Asked Questions". Creative Commons. Archived from the original on November 27, 2010. Retrieved 2010-12-05. ^ "FAQ – Is Creative Commons against copyright?". Creative Commons. Archived from the original on November 27, 2010. Retrieved 2010-12-05. ^ "FAQ – What is Creative Commons?". Creative Commons. Archived from the original on November 27, 2010. Retrieved 2010-12-05. ^ "How Does An Asian Commons Mean". Creative Commons. Archived from the original on July 25, 2008. Retrieved 2008-07-31. ^ Jorge, Cortell (May 2005). "Lecturer censored in Spanish University (UPV) for defending P2P networks". Own Website. Archived from the original on May 21, 2005. ^ Fleischer, Rasmus (May 2006). ""Mechanical music" as a threat against public performance" (PDF). Institute of Contemporary History, Sodertorn University College. Archived from the original (PDF) on June 27, 2007. ^ Kinsella, Stephan Against Intellectual Property (2008) Ludwig von Mises Institute. ^ Boyle, James (2008). The Public Domain. ^ Jessica, Litman, (2010-01-14). "Real Copyright Reform". Iowa Law Review. SSRN 1474929. ^ "Google Books is 'highly transformative,' appeals court confirms in fair use ruling". Fortune. Retrieved 2018-09-03. ^ Fleischer, Rasmus (June 2008). "The Future of Copyright". CATO Unbound. “We conclude that the snippet function does not give searchers access to effectively competing substitutes. Snippet view, at best and after a large commitment of manpower, produces discontinuous, tiny fragments, amounting in the aggregate to no more than 16% of a book. This does not threaten the rights holders with any significant harm to the value of their copyrights or diminish their harvest of copyright revenue,” wrote the court. ^ "Second Manifesto". Hipatia. Retrieved 2008-07-25. ^ a b c d Liang, Lawrence (February 2005). "Copyright/Copyleft: Myths About Copyright". Infochangeindia.org. ^ Selmer Bringsjord, "In Defence of Copying", Public Affairs Quarterly 3 (1989) 1–9. ^ Alfino, Mark, "Intellectual Property and Copyright Ethics", Business and Professional Ethics Journal, 10.2 (1991): 85–109. Reprinted in Robert A. Larmer (Ed. ), Ethics in the Workplace, Minneapolis, MN: West Publishing Company, 1996, 278–293. ^ Edwin Hettinger, "Justifying Intellectual Property" Archived March 19, 2013, at the Wayback Machine, Philosophy and Public Affairs, 18 (1989) 31–52. ^ Warwick, Shelly. "Is Copyright Ethical? An Examination of the Theories, Laws, and Practices Regarding the Private Ownership of the Intellectual Work of the United States. ", Readings in Cyberethics. 2nd ed. Ed. Richard A. Spinello and Herman T. Tavani. Boston: Jones and Bartlett Publishers, 2004: 305–321.